This article intends to provide detailed, step-by-step instructions that’ll help you set up ELEX Amazon Payments Gateway for WooCommerce. Refer the product page to know more about other various features of the plugin. Amazon Pay is one of the most convenient, and the trusted way used for payments. From large enterprises to the newest startups, Amazon Pay can help you grow customer relationships and build your business. With Amazon payment gateway, your customers can Checkout on your website with payment and shipping information, already stored in their Amazon account. When you add the Amazon payment method, anyone who has an Amazon account is ready to buy on your site! To understand Amazon Payments-WooCommerce integration, read this article. How to Capture Authorized payment from Order Page? 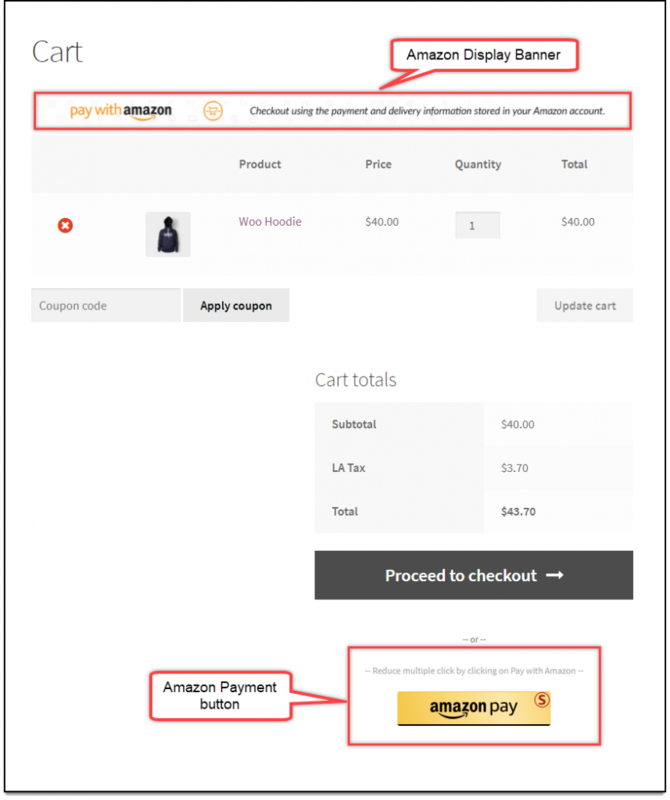 Skipping traditional WooCommerce checkout process: With our WooCommerce Amazon Payment Gateway plugin, you can add Amazon Pay checkout button on cart page itself. This will reduce clicks, and checkout time, hence giving your customers easy, and quick checkout experience. Full and Partial Refunds: You can perform full or partial refunds from the individual order admin page. 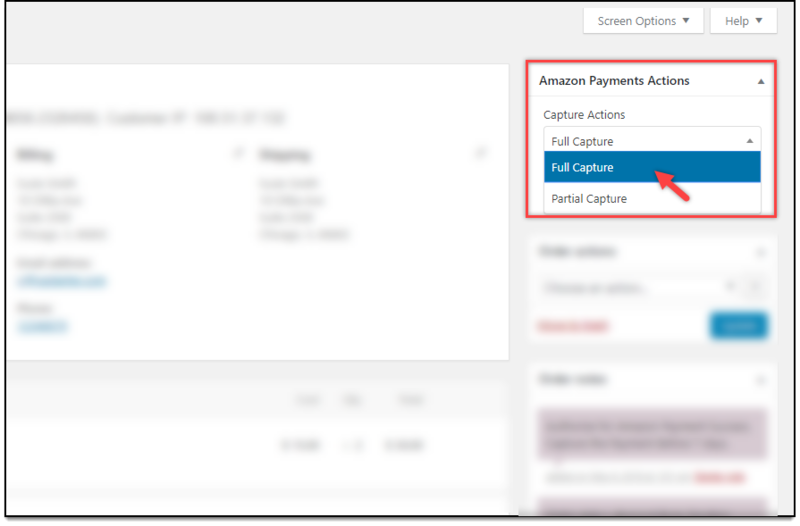 Capture Later: Enable this option in settings and do a payment capture of the payments later, when the stock is available and you are ready to ship. You can capture payments in full or in partial. Customization: The plugin provides options to add the desired logo or banner, button position, size, color, text, seller policy among other things, for Amazon checkout page. Dedicated Overview Page: A consolidated overview of Amazon Payments, where you can do one-click capture and refund. Dashboard > Plugins > Installed Plugins > ELEX Amazon Payments Gateway for WooCommerce > Settings. For Amazon Overview page, go to Dashboard > WooCommerce > Amazon Payments. 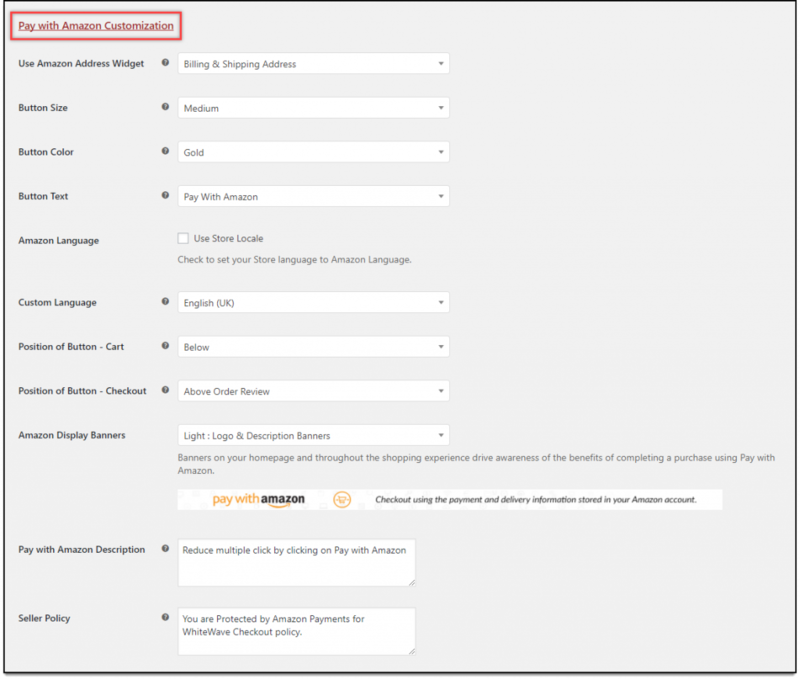 This section contains settings to enable/disable Amazon Payments, Amazon Overview Page, setting custom title and description, and selecting SSL mode. 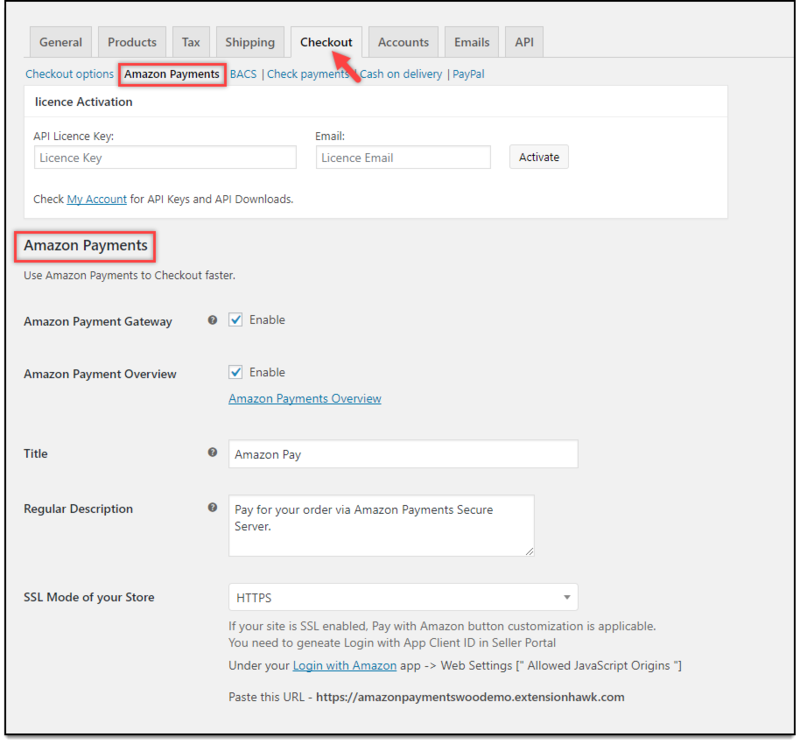 Amazon Payment Gateway: Tick this checkbox to enable Amazon Payment Gateway. Amazon Payment Overview: Tick this checkbox to enable Amazon Payment Overview. In this page, you can capture or refund the payment in a click. Refund can be partial or full as per requirement. You can also see all the order/transaction details. This page also shows you a graphical representation of an overview of the Amazon payment for a selected date range. You can also see captured, uncaptured, and refunded amount. Title: Enter a custom payment title in this textbox option. This title will be visible on the checkout page under the payment modes. Regular Description: Specify the required description in this text box. Customers can see this description on the checkout page under the Amazon payment title. SSL Mode of your Store: SSL (secure socket layer) is used to encrypt communications between the browser and the server, thus protecting sensitive data being transferred from your customers’ system. You will recognize SSL mode by seeing the familiar https:// in the URL of your browser’s address bar. This should always also be accompanied by a secure padlock symbol in your browser, often in the status bar at the bottom of the browser window, or in the address bar. HTTP: With this option, the above customization cannot be done. To use the Amazon payment gateway service, you should have an Amazon account. You can open a live account, or a sandbox account, free of cost. Refer our article to know how to obtain your Amazon Payments credentials. Once you receive your Amazon credentials, enter them in the following fields. Environment: Select required API mode for the payment gateway. 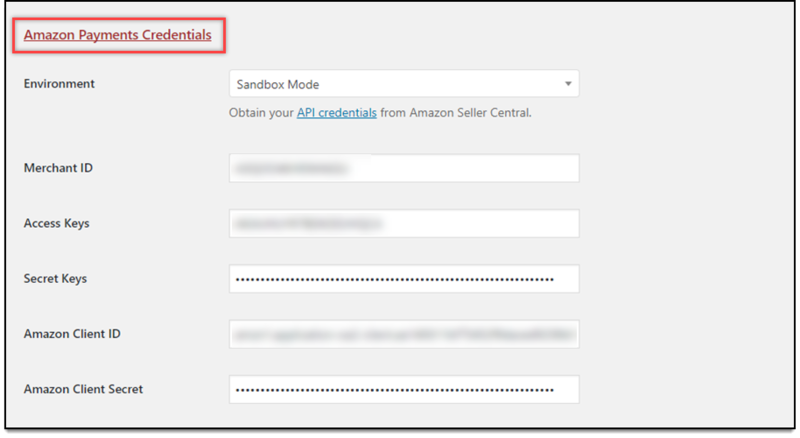 Sandbox Mode: It is used to do test purchasing by using Amazon API. There is no real money transaction involved in this mode. Remember, this mode is used only for development purpose and customers should not have access to this mode. Merchant ID: Enter the Merchant ID provided by Amazon. Access Keys: Enter your Access Key provided by Amazon, in this field. Secret Keys: Enter the Secret Key provided by Amazon. 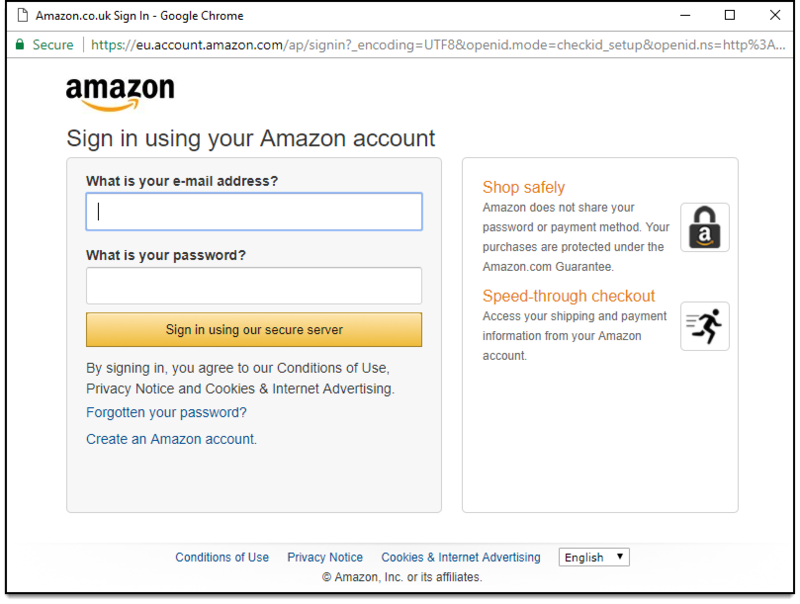 Amazon Client ID & Amazon Client Secret: Enter respective client ID and client secret in these text fields. Pay with Amazon (for Cart page): Tick this checkbox to allow customers to directly Checkout from cart page using Amazon payment option. This option will add an amazon pay button on the cart page. 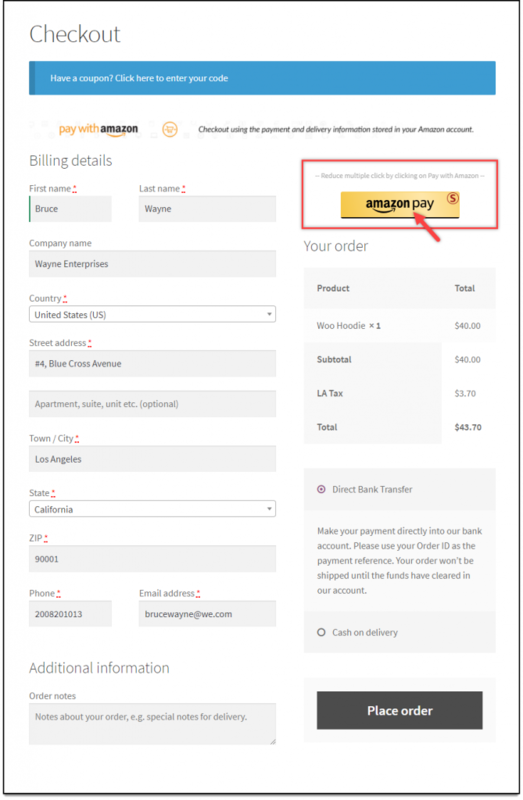 Pay with Amazon (for Checkout page): This option will add an amazon pay button on the checkout page, using which customers can make their payment. Payment Action: In this setting, you can select how the payments should be captured. Capture: Allows shop owner to get paid as soon as the order is placed. Authorize: With this option, the shop owner needs to authorize charges, and then capture the payment. 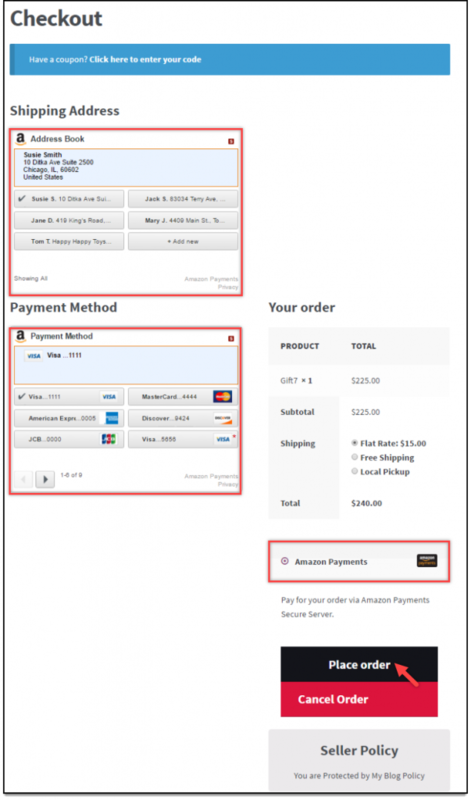 To capture payments, shop owner needs to navigate to individual order or Amazon overview page. Please refer, How to Capture Authorized payment from Order Page? In this section, you can customize the Amazon Pay button size, text, color, and position on the cart & checkout pages. In addition to this, you can set custom button description and seller policy. The settings are shown in the below screenshot. Use Amazon Address Widget: You can directly fetch billing and shipping address from your Amazon account. This address(es) will be displayed as a widget on the checkout page, replacing the default WooCommerce billing and shipping address fields. Button Size: Select the desired size for the Amazon checkout button. Button Color: Select the desired color for the checkout button. Button Text: Select the text for the checkout button. Amazon Language: Tick this checkbox to set your store language as Amazon payment language. Position of Button – Cart: Select either of the following options. Above: Amazon checkout button appears above WooCommerce checkout button on cart page. Below: Appears below WooCommerce checkout button on cart page. Position of Button – Checkout: Select either of the following options. Above: Amazon checkout button appears above WooCommerce checkout button. Above Order Review: Appears above order review. Above Order Payment: Appears above other payment methods. Below: Appears below WooCommerce checkout button. Amazon Display Banners: Banners on your homepage and throughout the shopping experience drive awareness of the benefits of completing a purchase using Amazon Payment. Pay with Amazon Description: Enter custom text which will be visible during the Amazon payment. 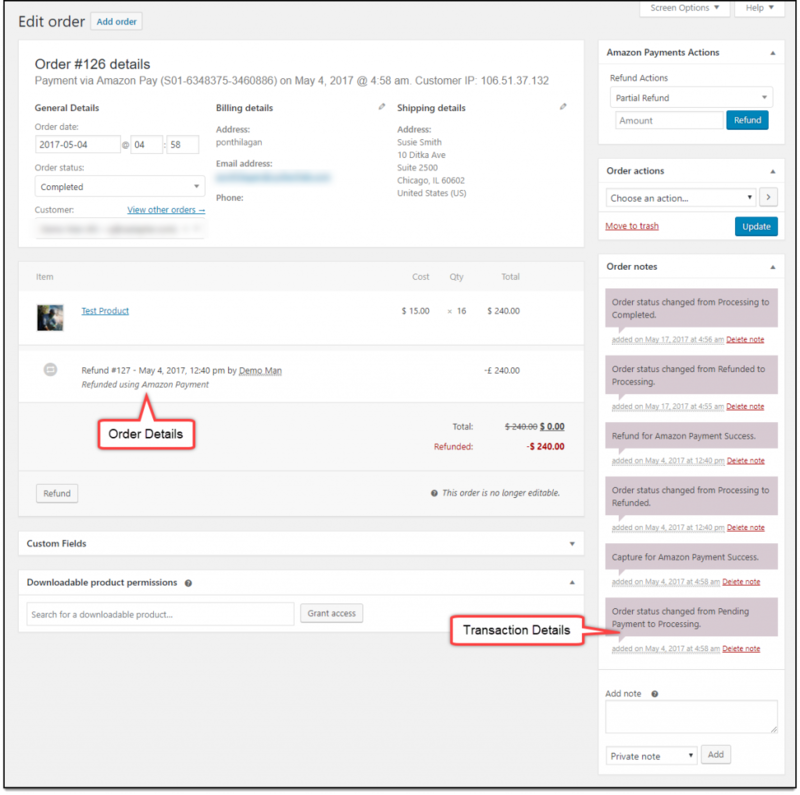 Seller Policy: Enter a description of your seller policy which will be visible on the order review page. If you are not getting payment option, then you enable Debug option to find an error(s). By enabling logging, you can trace the issue using log. The debugging setting is shown in the screenshot below. Logging: Tick the checkbox to troubleshoot issues with the plugin. Once the product(s) is added to the cart, the cart page looks as shown in the below screenshot. Click on Amazon pay button to proceed with payment. A new window will open where your customers need to login to their Amazon account, as shown in the screenshot below. Once customers have logged in to their account, they can make the payment. Once the payment is done, they are directed to review page of the order. A sample order review page is shown in the screenshot below. Finally, customers need to click on the Place Order button to place their order. The following screenshot shows how the Amazon checkout button displays on the checkout page. From the Amazon Payments Overview page, you can capture or refund the payment in a click. Capture and Refund can be partial or full as per the requirement. You can also see all the order/transaction details. Go to Dashboard > WooCommerce > Amazon Payments. In the Overview, you can see the Captured, Uncaptured and the Refunded amount by the Amazon Payment Gateway. 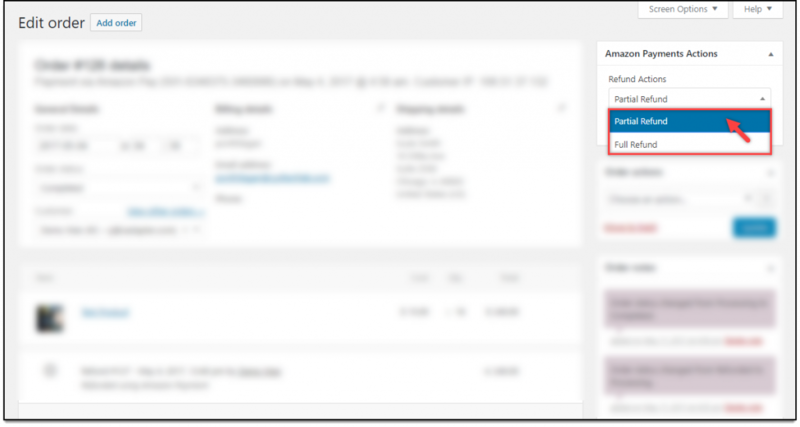 The plugin provides you the option to show the required number of rows under order details by using the Table Row option. You can also search the required order by using the search option. You can also see all Order and Transaction details (under Order Notes) from Edit Order Page. To do this, go to Dashboard > WooCommerce > Orders > the desired order. A screenshot of a sample order is shown below. 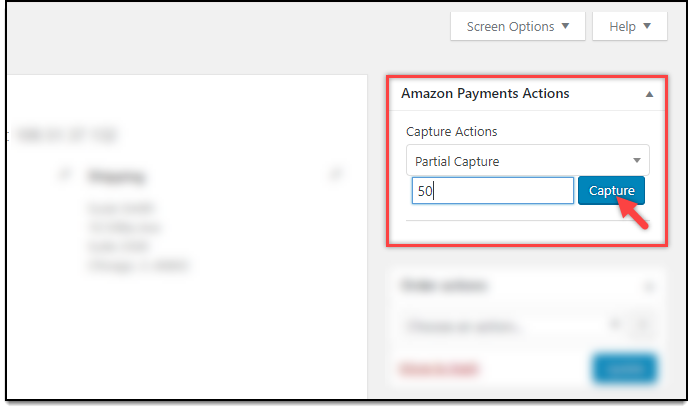 Under Amazon Payments Action box for Capture Actions, click either Full Capture for full amount capture or select Partial Capture for capturing partial amount. Once you select Partial Capture, you are provided with a text-box to enter the desired amount, as shown in the screenshot below. The maximum amount that you can refund to a buyer is 15% more than the previously charged amount (captured), or a maximum of $75 more than the previously charged amount, whichever is smaller. Read this article for more information on Issuing refunds. The following screenshot shows how partial and full refunds will be shown in the admin edit order page. Therefore, in this way, you can accept Amazon payments with our WooCommerce Amazon Payments Gateway plugin. If you still have doubts regarding choosing this payment, read Why you should choose ELEX WooCommerce Amazon Payments Gateway for WooCommerce plugin for your WooCommerce store. 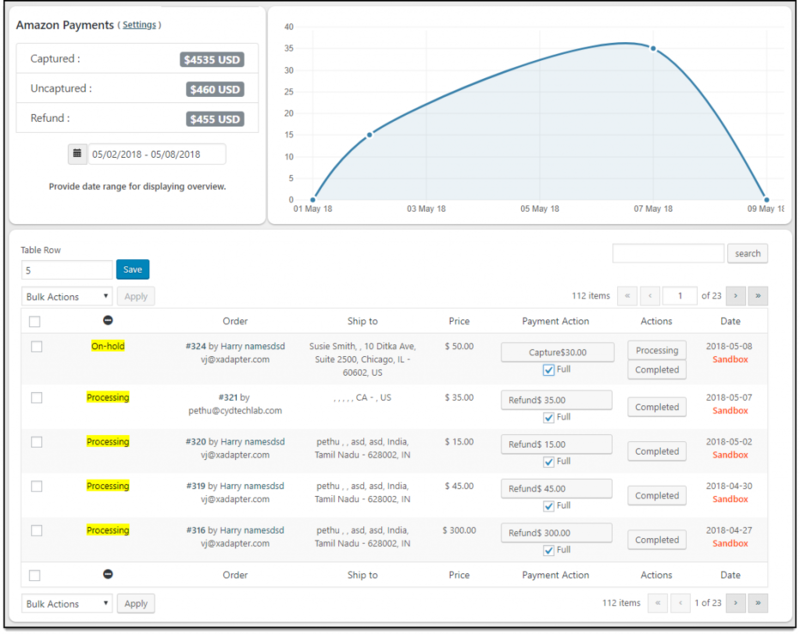 To explore more details about the plugin, go check out ELEX Amazon Payments Gateway for WooCommerce. check out the product documentation section for more related articles.